See later post for the reds of pinot noir and saint laurent, which grow further south. Rotgipfler and zierfandler have both been around for a long time, and, said Bernhard Stadlmann, of Weingut Stadlmann they “are the two most noble grape varieties of Austria, along with riesling and grüner veltliner.” Neither are widely planted – “there are around 140 hectares of rotgipfler and 120 ha of zierfandler” said Willi Balanjuk of Freigut Thallern, one of the oldest wineries in Austria, founded by Cistercian monks in 1141. 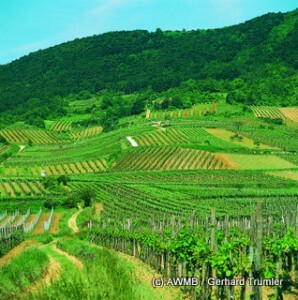 In the north, vineyards lie on an east-south-east facing limestone slope around 200 to 400m above sea level. 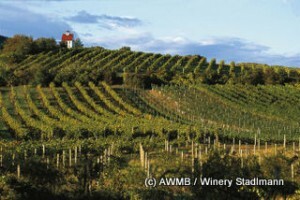 Balanjuk said this “slightly hillside location, at the east of the Alps, produces concentrated medium bodied wines based on limestone.” The vineyards around Gumpoldskirchen were historically regarded as the most favoured for growing rotgipfler and zierfandler, and these were traditionally blended together, but now are increasing made as single varietal wines. Both varieties are based on the traminer family so inherent perfume is one of their trademarks, though rotgipfler “has a more constant aromatic profile” said Balanjuk. And where rotgipfler has thicker skins and takes on a green gold hue with ripeness, so zierfandler has thinner skin and takes on a red hue with ripeness, hence is alternative name spätrot. Mostly, wines are fermented in stainless steel or big old wood, and aged on lees in big wood. This is a good way to harness the aromatic potential without stifling the grapes natural expressiveness and structure. Though hugely niche, these are some tasty whites. Whilst little rotgipfler or zierfandler is found outside Thermenregion, these two varieties account for around 10% of the region’s total vineyard, keeping their position very specific. Hint of white pepper on the nose, with sweet yellow fruits. Lovely rich yet medium weight texture, with a hint of chalky backbone structure, along with intense, succulent fruit flavours. Long finish. The lighter style of the four in this flight. Hints of aromatic smoke on the nose, followed by ripe yellow fruits, peach and pineapple, with good concentration. Big intensity and freshness with plush, lush fruits. Spicy nutmeg and pineapple nose, quite a full palate, rich and plush, with wonderful depth of ripe, sweet fruits. Nothing not to like. Long, round and plush. Sweet note at the front, tropical fruit, with a feel of gentle vanilla spice very much in the background. This adds an extra dimension to the fruits, which have huge concentration and dimension. Lifted melon nose, fresh, clean, almost appley. Pure and crystalline fruits. Hint of phenol support. Aromatic, supple, dry and tasty. Tropical and wafting smokiness on nose, fuller body, sweet lush yellow fruits, pineapple, mango, rich and concentrated. Bit of spice in the backbone for a clean dry and long finish. Vg. Rich, sweet fruit, fresh, red apple and citrus along with crystalline pineapple. Lovely intensity and personality. Plush and enticing. Lovely golden colour. Honey, honeysuckle. Marmalade and tangerine notes on the nose. Complex nose, palate fresh and full with rich fruitcake and tangerine pithiness. Very nice. I love this region, where I was lucky enough to live for a couple of years. Do these wines exhibit terroir ? I don’t know but they are unlike those from anywhere else and ought to be better known.